For more information please call (818) 882-1212 or email [email protected]. To register your fruit trees for Citrus Sunday or any time of year, call (818) 530-4125 or go to www.foodforward.org. Be the first to spot a Valley Disaster Preparedness Fair bus bench ad in the City of Los Angeles! Whoever sends the first email received at [email protected] (based on the email timestamp) with a photo of the ad and the location (nearest intersection and city) of the bench in the photo will win a Mini Mystery Kit of EP Supplies. Will it be you? Keep your eyes open and you just might be the winner! The 8th Annual Valley Disaster Preparedness Fair is on Saturday, October 3, 2015 at Fire Station 87, 10125 Balboa Blvd., from 10:00 an to 2:00 pm. Info or to register: ValleyDisasterFair.com. To date, over 25 Neighborhood Councils have agreed to host Outreach booths at the Fair. Thank you! Southern California Preparedness Foundation Board and Advisory Board members and employees of Martin Outdoor Media and their immediate families are excluded from participation in this contest. ¡Hola! ¡Es tiempo para fiesta! 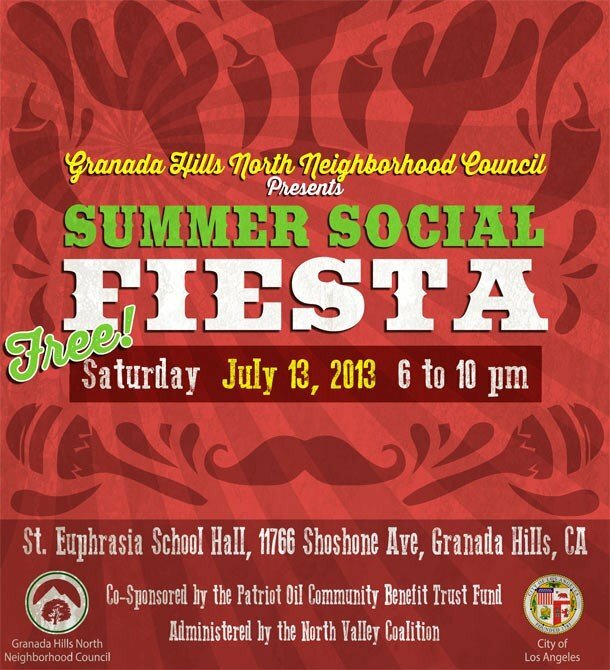 Granada Hills North Neighborhood Council is having our 3rd Annual Summer Social and you, our Stakeholders, are invited for an evening of food and fun—fiesta style. We’ll have authentic Mexican food by Custom Caterers, live music and dancers by Azteca Mexico, piñatas, sombrero games, Magic Castle magician Mark Paskell, trivia games, cactus ring toss game, and a special Macho Nacho eating contest. GHNNC board member and Educational Representative Steven Steinberg will be teaching the Mexican Hat Dance, Salsa, and other fun dances. 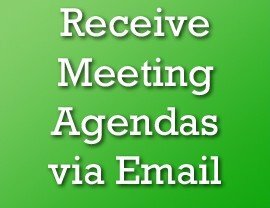 Come for the excitement, have a nice meal, meet your neighbors, talk with your elected board members, and have a wonderful evening. 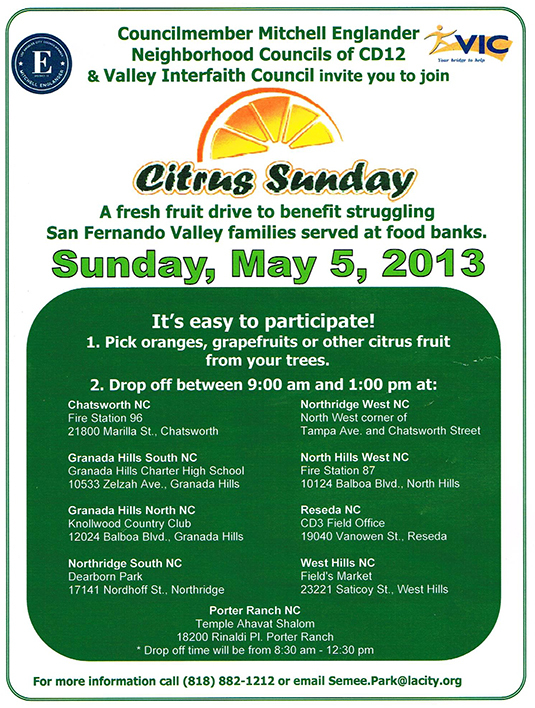 Save the date for Council District 12’s Eighth Annual Citrus Sunday coming up on Sunday, May 5. This volunteer fruit drive brings tens of thousands of pounds of fresh oranges and grapefruits to food banks that serve struggling San Fernando Valley families. Join Northridge West, Northridge South, Granada Hills North, Granada Hills South, Porter Ranch, Reseda, Chatsworth, and West Hills Neighborhood Councils along with Temple Ahavat Shalom for this great event! 1. Just pick oranges, grapefruits or other citrus fruit from your trees, or ask your neighbors if you can pick from their trees. 2. Drop them off at participating locations between 9:00 am and 1:00 pm on Sunday, May 5. Our partner organization, Valley Interfaith Council (VIC) will collect all the fruit and distribute it to families served at VIC food pantries in the San Fernando Valley. Please mark your calendars and plan to attend the City of L.A. Bureau of Sanitation 2013 “Discover Recycling” Open Houses! Families, children and residents of all ages have the opportunity to meet Sanitation collection truck drivers and staff, enjoy truck demonstrations and facility tours as well as receive information about recycling and a host of Sanitation services. Saturday, April 27, 2013 – 9:00 a.m. to 2:30 p.m.
Saturday, May 18, 2013 – 9:00 a.m. to 2:30 p.m.
Saturday, June 1, 2013 – 9:00 a.m. to 2:30 p.m.
Saturday, June 8, 2013 – 9:00 a.m. to 2:30 p.m.
Saturday, June 22, 2013 – 9:00 a.m. to 2:30 p.m.
Saturday, June 29, 2013 – 9:00 a.m. to 2:30 p.m. If your New Year’s Resolution was to spend more time checking out local museums, your budget is no excuse this weekend, as several area facilities will be absolutely FREE to visit. The Museums Free-For-All event is in its eighth year, and for several venues the offer stands for both days. Exceptions are ticketed events, like the California Science Center’s Endeavour space shuttle exhibit, and for The Getty, you’ll need to book time-based free tickets. Over at LACMA, the Kubrick and Caravaggio exhibits are not included, and for all venues, things like parking will still cost you a few bucks. Still, on January 26 and/or 27, places like The Autry, The Craft and Folk Art Museum, The Fowler Museum at UCLA The Hammer Museum, The Museum of Contemporary Art, Skirball Cultural Center, and The Paley Center for Media and more will be free for you to roam and enjoy. Looking for Free Museum Days? Select museums offer free admission and many offer free admission times/days. Learn more by downloading the Free Museum Days PDF.